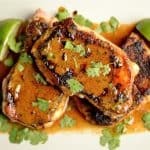 These Pork Chops are cooked to perfection on a skillet, and dressed up with a deliciously creamy, smoky chipotle sauce! 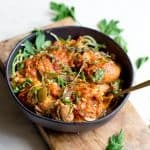 A quick and easy dinner packed with flavor that is dairy-free, Paleo, and Whole 30 compliant. Pork chops aren’t really my thing you guys. I am much more of a chicken, steak, or vegetarian meal kinda girl; I’m sure you can tell. But in an effort to change things a round a bit, I went outside my comfort zone and pan seared these pork chops. 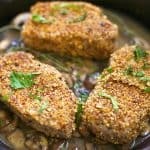 The whole family loved these, and now I can officially say that pork chops can be my thing! The dry rub, the sauce, and the flavoring of a pan seared chop were just perfect. I used my favorite flavoring combinations here: chipotle, lime, and cilantro. Canned coconut milk is used here to create the dairy free creamy texture. I think it perfectly balances out the spice with a hint of natural sweetness! To start I heated up my skillet while I prepared a quick and easy dry rub. I flavored up the pork chops, added some olive oil to the pan, and let the sear for 4-5 mins per side. While they were cooking, I blended up the sauce: coconut milk, cilantro, chipotle seasoning, and liquid smoke. Pork chops can be a bit tricky to cook, as you want them to be cooked through with just a tiny bit of pink on the inside. They will continue to cook once you remove them, but this allows them to retain flavor and juiciness. Once both sides were perfect, I dumped the sauce into the pan scraping up leftover seasonings from the rub. It was perfect!! We served alongside roasted vegetables and rice (cauliflower rice for me). They were a bit spicy, but my kids still were able to eat them without complaints. Because my tolerance for spice is high, I rely on them to be the judge! We all thought they had just the right amount of kick. You can add more sauce to each pork chop for even more flavor and spice, or keep the sauce at a minimum to reduce the spice. I hope you enjoy!! 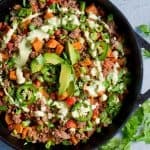 Looking for more Whole30 recipes? 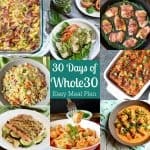 You can also check out my 30 days of Whole30 complete meal plan! Begin by heating a large skillet to medium high heat. Prepare your pork chops. Mix together ingredients for the rub, brush each pork chop with olive oil. Rub each side of the pork chops with spices, and use remaining olive oil to coat your skillet. Cook your pork chops for 4-5 minutes per side, or until the center reaches 165 degrees and is only slightly pink. Reduce heat to low. 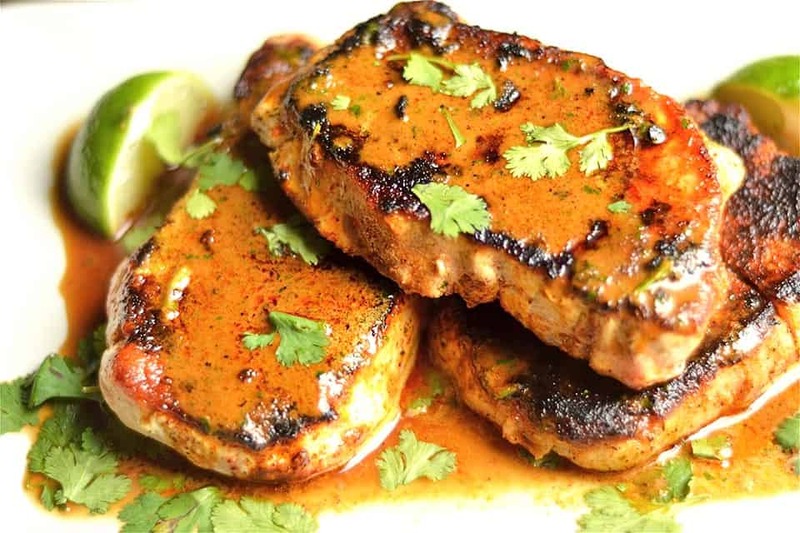 While the pork chops are cooking, mix together coconut milk, chipotle pepper, cilantro, and liquid smoke in a blender or food processor until smooth. Once pork chops are cooked through, pour the sauce on top. Reduce heat to low, and scrape any bits of rub seasoning to add to the sauce. Garnish with juice of 1 lime and extra cilantro (optional) and serve immediately. I was literally just thinking about pork chops this morning! That rub sounds crazy delicious. Oh my gosh! YUM! 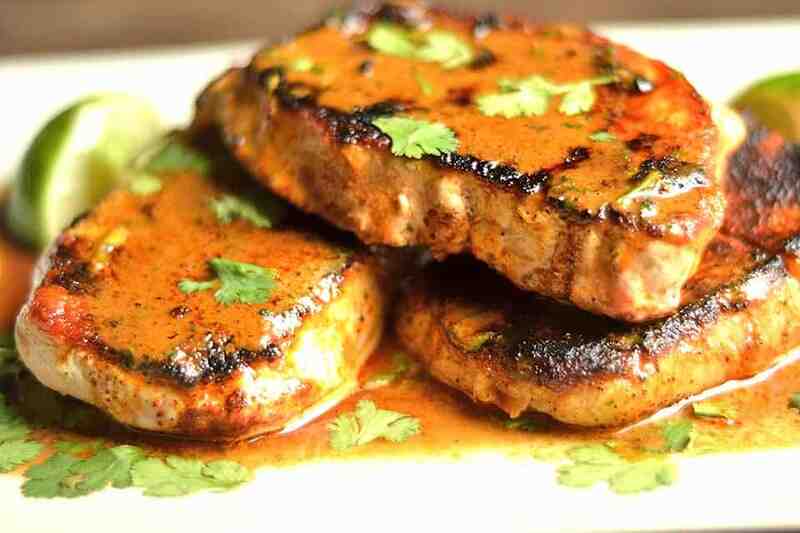 These pork chops look SO good! I just love cilantro and lime! Such great additions! Thanks for sharing! On my list for next week! These sound AMAZING! We made your maple Dijon chicken this week and literally it was my favorite paleo dish we have made yet! Would this work with chicken? Would these work on the grill? Yes, the only difference is that for the sauce, you would need to cook it separately on the stove top. It tastes best warm! We tried this recipe last night, and it was DELICIOUS. We grilled them and poured the sauce on top when they were done. Made it with a cauliflower puree, which worked perfectly with it. Thanks for the awesome recipe! Thank you, so glad you enjoyed them Cara! We grilled them the other day and loved that variation too! These look so good! Any ideas on how to replace the coconut milk and still keep it dairy free? I’m allergic to coconut. Thanks!! Hi Bri! I would think about just omitting the coconut milk without substituting anything else, it still tastes delicious! If you still want that creamy texture, maybe a cashew milk? These were absolutely scrumptious! My family was drinking the sauce with a spoon! Awesome!! The only chipotle powder I could find is chipotle pepper flakes. Is that what you are using? Do you think that will work? Kristin, I think that could work. I do use a powdered form of chipotle spice that can be found in most grocery stores in the spice section. You can also use Adobo sauce from canned chipotles. But, work with what you have and let me know how it turns out! I made this 2nd recipe, they are soooooo really delicious! i’m gonna say is— 5 stars. I made these tonight! I did change the sauce a bit because I had a few chipotle peppers to use up, so I blended seeded chipotle peppers with the coconut milk and added a bit of salt. Delicious! These are delicious! My husband is not a fan of porkchops and I probably haven’t cooked porkchops in over a year. I came across this recipe and decided to give it a try. My husband LOVED them and I have cooked them two weeks in a row per his request! Amy these were fabulous! 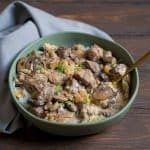 Would you mind if I posted about your recipe and link back to you and this post? Of course!! Glad you loved it! 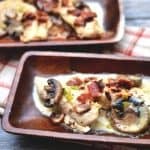 This recipe has been a delicious part of my lunch and dinner menu this week. Paired with cilantro lime cauliflower rice, this is a hit. Thank you! I’m never one to post but after my boyfriend’s reaction and his request for more I had to leave a great comment for a non-frequent cook. It had such a simple yet savory flavor. Cooking the pork chops for 6 minutes was perfect on the skillet. My boyfriend is not doing the Whole 30 so I made a cilantro rice since I had so much leftover with a side of garlicky carrots and potatoes in the oven. I can’t rave enough about this recipe that I had no more pork chops but yet kept the leftover sauce. Thanks so much for your comment, Rosie!! We had these for dinner too, with broccoli and potatoes. So glad you loved them! Made tonight since it has been on my list. I love your recipes. I made this one to the “T” but the sauce separated; I honestly think it was too much oil. I would also recommend making the sauce first. It’s too much of a frazzle to make the sauce while the pork chops are cooking. Better have it ready to just pour in the pan since the cooking time is so short. Served with mashed white sweet potatoes and sauteed swiss chard. The best thing about this recipe is that it’s so fast. Hi, what brand of liquid smoke have you found that is whole30 compliant? I haven’t found one yet! Wright’s brand or Cedar House are both compliant. So yummy! I thought it was perfect. My husband would like more chipotle flavor so maybe next time I’ll chop some chipotles and add that but I can’t stop going to the kitchen to get little tastes of the sauce. Oh my goodness. Made this for my family tonight and we all died. It’s so hard trying to eat healthy sometimes, but this tasted like something from a fancy restaurant. Thanks for sharing! LOVE hearing that!! You are so welcome! 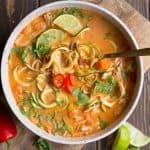 This is one of my favorite Whole30 recipes! I’m wondering if this would freeze well? I have not tried it, but I don’t think it would work well with coconut milk unfortunately. I so wanted to love this. 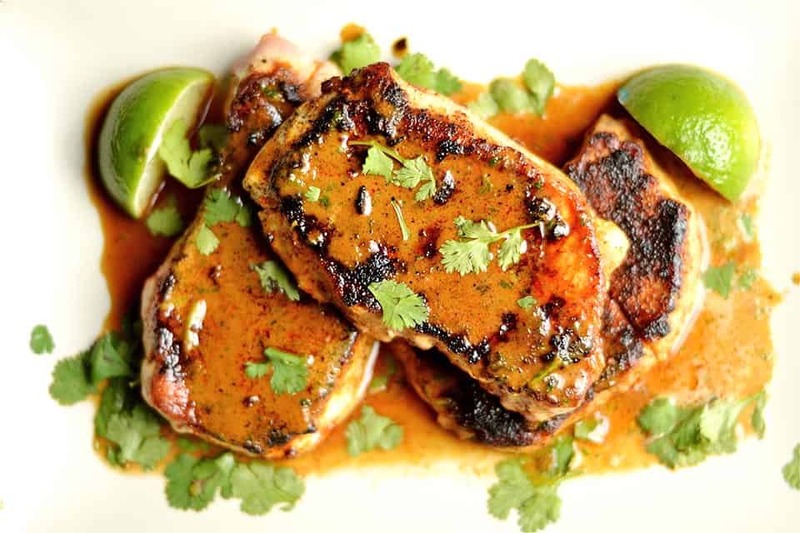 We love chipotle, pork chops and coconut milk so win, right? The biggest issue I had was the watery consistency of the sauce. I ended up reducing it by about 60% so there was some body to the sauce. I’ll continue to tweak this because I believe in the flavor profiles.